I can’t remember when the subject of God infused the films recognized at the Oscars like it did this year. It testifies to the power of story to shape and set the wet concrete of cultural imagination. To use a phrase from last year’s Oscar-nominated Moneyball, the medium holds a unique ability to “change the game” in ways few others can. God has always been a part of humanity’s best stories—if not their writer, director, and lead or best-supporting actor. The entire film celebrates this promise: If we seek God with our whole heart, we will find Him. The depictions of God’s character conveyed in Oscar-winning movies like Les Miserables and Life of Pi provoke meaningful reflection and insight into how we think about, imagine, and interact with our ideas about God and faith. These films arrive at a crucial time in our cultural conversation. While we are reconsidering and reimagining the role religion should play in the multicultural theater of American life, art is helping to lead the way. Les Miserables, adapted from Victor Hugo’s book of the same name, stands out as the year’s most overtly theologically centered film. Despite the number of explicit Christian themes presented throughout the film, it still drew millions to the box office. The score contains multiple references to God, heaven, Jesus, and the soul; an entire song (“Bring Him Home”) devoted to prayer; and several explicit descriptions of or allusions to the Bible, the blood of Christ, the Passion, the way of the Lord, Calvary, the blood of the martyrs, salvation, and sainthood. Hugo exposes the same raw theme through multiple characters: Suffering is an equal opportunity employer. Tragedy, sorrow, and pain befall us all. As Jesus reveals in His Sermon on the Mount, God gifted the sun and rain to both the just and the unjust; blessing comes to both the law-keeper and the law-breaker, the worthy and the unworthy, as do mourning and grief. Javert’s mechanized, reward-based theological worldview requires him to strive mightily to both earn his privileged position and avoid evil. A deadly pride results. For ex-con Jean Valjean, such efforts prove both impossible and self-defeating. He realizes grace and love do not avoid suffering, but rather are essential elements in the midst of misery and evil. At first glance, Life of Pi, adapted from Yann Martel’s 2001 novel, seems a simpler story. Yet, when considered as a multicultural pursuit of a prevenient God seeking relationship with humanity, along with its insightful investigation of divine revelation, the film becomes a cross-cultural theological powerhouse. From the opening scene, the story unfurls a long, expectant, and revealing journey toward the development of a robust belief in God. Pi’s pursuit of God is indefatigably beautiful. Although his haphazard journey of faith occasionally flails, a grand plan prevails. The audience is left to wonder if perhaps this is the result of a divine Planner who guides, directs, and protects the young boy’s quest. Some contend Life of Pi exemplifies the religiously Universalist “coexist” movement. Certainly, Pi momentarily embraces aspects of Hinduism, Islam, and either the atheism or agnosticism of his pragmatic father. Yet Pi’s expectant faith in God and his individual reasoning mind—working together—deliver or save him from tragedy. The movie does not champion one religious worldview over another, and Pi is not caught inside the maze of doctrinal trappings often emblematic of organized religious life. On a lifeboat, bereft of all the accouterments and distractions of culture, tradition, history, and authority, Pi must look into the tiger eyes of his own soul. Easy answers and professed beliefs evaporate under the blazing relentlessness of Truth. In solitude, Pi finds the unfettered God he longs for. Why? Because he seeks God with his entire being, and he finds God despite his naïveté and multipurpose-room theology. The entire film celebrates this promise: If we seek God with our whole heart, we will find Him. A wise person once shared with me, tongue in cheek, that God is big enough to forgive even bad theology. Perhaps Valjean and Pi’s stories, like our own, end up being a hearty “Amen!” to that hope. Theology, like life, is messy, nonlinear, more poetic than formulaic, with more curves than angles. Straight lines and perfect circles abound in nature, but prove difficult to find. So, too, rigid theological geometrics are helpless when considering the mind and character of our Creator. Both of these Academy Award-winning movies provide a glimpse into the Divine revealed in and through human life. Valjean and Pi force us to look into our preconceived notions about God and ask: “What does our characterization of God reveal about ourselves?,” “What do we expect of our religious life?,” and “How should we respond to the possibilities created by a loving God who permeates our world?” These films also remind us that a loving God looks only on the prodigal’s heart and willingly forgives naïve and misguided theological constructs. Finally, where our ideas and beliefs may fail and lead us astray, the arts allow us to reimagine what is possible, beneficial, and beautiful once again. Read Gary Black Jr.'s opinion article, And the Oscar Goes to God?, in the San Gabriel Valley Tribune. 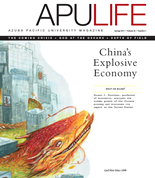 Originally published in the Spring '13 issue of APU Life. Download the PDF or view all issues.